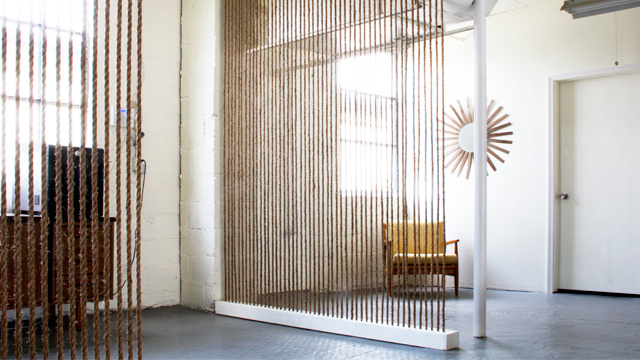 Traditional room-dividers can be expensive, but rope is cheap. You can make your own by building simple wooden boxes to stretch pre-cut lengths of rope from ceiling to floor. You can use any rope you want, though jute and hemp seem to be the most popular picks for use indoors. It's also easy to estimate how much you'll need once you know where you want the room split, so you don't have to worry about buying too much or too little. The wood boxes that act as anchors can probably be replaced by just about anything, too. Check out the link below for more images and instructions. There looks to be about 40 to 50 lengths of reasonably thick rope in the divider in the photo. The ceilings look pretty high, 3 metres or more, so that's at least 120 metres of rope. That's around $150-200 from my experience, so not particularly cheap. Shame about that as it does look quite good.